Hermione Harbuttt Earrings are handmade from the finest components such as stunning Swarovski crystal and beautiful clusters of pearls. We have many pairs that you can purchase to take away, and as all of our jewellery is custom made, we can custom design earrings with clip on attachments should you wish to wear some sparkle for a special event without pierced ears. An earring is a piece of jewellery attached to the ear via a piercing in the earlobe or another external part of the ear (except in the case of clip earrings, which clip onto the lobe). Earrings are worn by both sexes, although more common among women, and have been used by different civilisations in different times. Locations for piercings other than the earlobe include the rook, tragus, and across the helix (see image at right). The simple term “ear piercing” usually refers to an earlobe piercing, whereas piercings in the upper part of the external ear are often referred to as “cartilage piercings”. Cartilage piercings are more complex to perform than earlobe piercings and take longer to heal. Earring components may be made of any number of materials, including metal, plastic, glass, precious stone, beads, wood, bone, and other materials. Designs range from small loops and studs to large plates and dangling items. The main characteristic of stud earrings is the appearance of floating on the ear or earlobe without a visible (from the front) point of connection. Studs are invariably constructed on the end of a post, which penetrates straight through the ear or earlobe. The post is held in place by a removable friction back or clutch. A stud earring features a gemstone like a diamond, tanzanite or other ornament mounted on a narrow post that passes through a piercing in your ear or earlobe and is held in place by a fixture on the other side. Studs most commonly come in the form of solitaire diamonds. Occasionally, the stud earring is constructed so that the post is threaded, allowing a screw back to securely hold the earring in place. This is useful in preventing the loss of expensive earrings containing precious stones, or made of precious metals. Hoop earrings are circular or semi-circular in design, and look very similar to a ring. Hoop earrings generally come in the form of a hoop of metal that can be opened to pass through your ear piercing. They are often constructed of metal tubing, with a thin wire attachment penetrating the ear. The hollow tubing is permanently attached to the wire at the front of the ear, and slips into the tube at the back. The entire device is held together by tension between the wire and the tube. Dangle earrings are designed to flow from the bottoms of the earlobes, and are available in various lengths from a cm or two, all the way to brushing the shoulders. They are generally attached to the ear by the use of thin wires, which go through the earlobe and connect to themselves in a small hook at the back. A variation is the French hook design, which merely hangs from the earlobe without closure, although small plastic retainers are sometimes used on ends of French hooks. 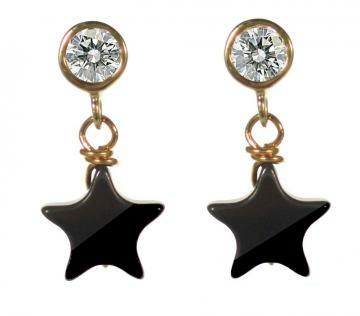 Rarely, dangle earrings use the post attachment design.